FLAGSTAFF, Ariz. — Uber suspended all of its self-driving testing Monday after what is believed to be the first fatal pedestrian crash involving the vehicles. The testing has been going on for months in the Phoenix area, Pittsburgh, San Francisco and Toronto as automakers and technology companies compete to be the first with the technology. Uber’s testing was halted after police in a Phoenix suburb said one of its self-driving vehicles struck and killed a pedestrian overnight Sunday. The vehicle was in autonomous mode with an operator behind the wheel when a woman walking outside of a crosswalk was hit, Tempe police Sgt. Ronald Elcock said. The woman, whose name hasn’t been released, died of her injuries at a hospital. 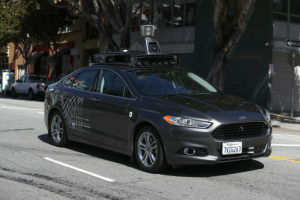 The number of states considering legislation related to autonomous vehicles gradually has increased each year, according to the National Conference of State Legislatures. In 2017 alone, 33 states introduced legislation. California is among those that require manufacturers to report any incidents to the motor vehicle department during the autonomous vehicle testing phase. As of early March, the agency received 59 such reports.